For over 70 years residents and businesses have relied on our firm. Since Charles Suisman, Max Shapiro and Louis Wool established themselves as skilled eastern Connecticut attorneys in the 1930’s and collaborated in the 1950’s to form our firm, we have been protecting the interests of average citizens. As our firm has grown, our attorneys have continued to offer innovative, effective solutions for legal problems. Residents and businesses in Connecticut have responded – Suisman Shapiro Attorneys-at-Law is now the largest law firm headquartered in eastern Connecticut. Even when Mr. Suisman was joined by partners Max Shapiro and Louis Wool in the 1950’s, a general practice attorney could still handle most matters capably. Since then the law has changed. In order to offer comprehensive and effective counsel for today’s more complex legal environment, each of our attorneys now focuses on specific practice areas. Personal injury claims and civil litigation are handled by board-certified trial lawyers John Collins, Matthew Auger, Matthew Shafner and Roger Scully. If you are involved in a disputed motor vehicle/auto accident injury claim, a claim or lawsuit involving another type of accident, or a contract dispute and would like to speak with one of our trial attorneys, contact our New London office and make an appointment for a free consultation. Family law Attorneys Michael Blanchard, Jeffrey Hill, Ryan Jaziri and Robert Tukey protect the interests of clients involved in the sensitive areas of divorce, custody and division of property, crafting solutions that are both financially and emotionally reasonable. Attorneys James Berryman, Carolyn Kelly, Robert Keville and Matthew Shafner represent workers injured on the job, handling federal and state workers’ compensation, Social Security disability claims, asbestos litigation and appeals. If you have a concern about workers’ comp or SSDI, contact our office to arrange a free consultation. Aggressive and effective criminal defense representation is provided by trial lawyers Michael Blanchard and Bryan Fiengo against charges ranging from DUI and fraud to homicide/murder. Our Business Law attorneys Raymond Baribeault, Eric Callahan, and Ryan Jaziri represent individuals, companies and banks in all types of Business and Commercial Real Estate transactions including entity formation, purchases and sales, financing and corporate structure, governance, and succession issues. All aspects of Residential Real Estate transactions are handled by our residential real estate department. Suisman Shapiro Attorneys-at-Law Elder Law, Probate and Estate Planning department, handled by Attorney Jeanette Dostie, is involved in all types of probate and estate matters, development of estate plans and preparation of documents, from simple wills to complex, tax oriented trusts. Attorneys Eileen Duggan and her department represent public and private sector employers and individual employees in the areas of Labor and Employment Law. Attorneys Michael Carey, Bryan Fiengo and Ryan Jaziri provide counsel, advice and representation to municipalities, businesses and individuals in the areas of Municipal, Land Use and Planning and Zoning Law. 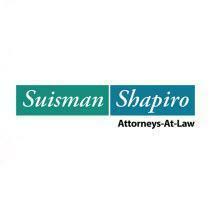 Avoid the Worry - Contact Experienced Attorneys at Suisman Shapiro Attorneys-at-Law. Regardless of whether you've been seriously injured, arrested, are contemplating divorce, have an employment issue, or need information regarding business formations, understanding the issues involved is essential to making informed decisions. At Suisman Shapiro Attorneys-at-Law we work closely with our clients to ensure they know the issues at stake and the options available to them. Suisman Shapiro Attorneys-at-Law serves clients from New London County, Windham County and Middlesex County including the communities of: New London, Norwich, Waterford, Groton, East Lyme, Stonington/North Stonington, Lyme/Old Lyme, Old Saybrook, Ledyard and Montville.